It’s a funny thing when you think about it. The whole year goes by and it’s not until the end of it that we think we should look back and review. Review everything we did and didn’t do throughout the year. Maybe we should do it more often, every week or every 6 months. Funny or not, it’s a good excuse to think about why you didn’t quite achieve your goals. Let’s look at 3 realistic and achievable goals for your health in 2017. I chose 3 because it’s a good number. It’s not too many goals that you get overwhelmed trying to achieve and it’s just enough so you don’t get bored. It sounds hard but trust me, it’s not. When I say quit sugar I don’t mean entirely and forever. The initial stage to success is to reduce your sugar intake and learn about what’s in your food. I had no idea how much sugar was in a lot of the ‘healthy’ food I was consuming. Fructose is the bad stuff. The only organ that can process fructose is the Liver. If not processed and burnt as energy it turns directly into fat. It’s highly addictive and always has you wanting more. You can see more about recent scientific studies re sugar and it’s harm on the body here. When you remove sugar from your diet you will be surprised. Surprised about how delicious ‘normal’ foods taste. Vegetables are sweet, they really are ! 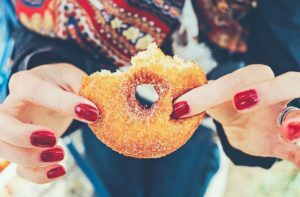 The idea of quitting sugar is to reset your body by eliminating it and allowing yourself to then indicate how much you need – which you will learn is not a lot at all. I still enjoy fruit, but my low fructose fruits like berries. If you need a little guidance Sarah Wilson has a very achievable 8 week program to launch your sugar free life. Not a hard-core yogi but a relaxed and slightly dedicated yogi. Remember, We are focusing on setting achievable goals so don’t go over bored. If you incidentally become a hard-core yogi – awesome. If you don’t, it doesn’t matter because that’s not what we were aiming for. Why yoga ? It’s been around a long time, like your grandma, and has exceptional health benefits. It’s an ancient Indian philosophy that dates back thousands of year ago (so maybe a little older than your gran!). It’s been on your mind for a while now, I can tell. So 2017 is the year to take the leap. A fitness treat is perfect for anyone. If you need to kickstart your fitness regime, reboot your old one or take a week to mix fitness and relaxation – it’s for you.